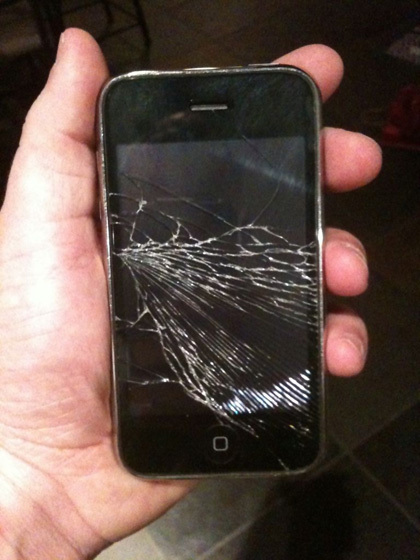 If you were to crack the glass on your 3G iPhone, should you? While I thought I’d never have to answer this question, Ames accidentally dropped her iPhone last week and deciding what to do about it was tougher than you might think. Once we got past the tragedy of the situation and faced reality though, we found that replacing a cracked iPhone screen yourself is actually quite inexpensive and straightforward. While it doesn’t say so in the product description, the replacement screen & digitzer actually came with the necessary screwdriver and suction cup mentioned in the video, as well as the adhesive strips. The whole repair took about an hour and a half, roughly the length of the second half of South Carolina’s unwatchably poor performance in the PapaJohns.com bowl. The video does a great job of breaking down the process but we did run into a couple hiccups. 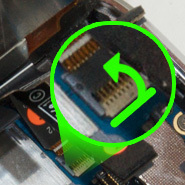 The first problem came when disconnecting the LCD assembly from the phone. There are 3 wires to disconnect, labeled 1, 2 & 3. The first 2 wires pop straight up, but the description for releasing the 3rd wire wasn’t very clear. There’s a little off-white tab that must be flipped up (see image to the left) so that the 3rd ribbon wire can slide out from the other side. The other problem we ran into, and the step that took the bulk of the time, was separating the glass and digitizer from the frame. It took a lot of heating with a hair dryer before the glass finally started letting go from the plastic frame. The person in the video used a heat gun, which probably would have worked better, but the glass is glued all the way around frame. Despite how cracked the screen looked, we actually managed to peel our glass off in one piece, but it took a lot of time and patience. It probably didn’t hurt that Amy had a screen protector on her phone that held together all the shattered glass. Other than those two slow-downs, the process was as simple as advertised. Once the new glass/digitizer was affixed to the frame using the included adhesive strips, reassembling the phone was as simple as following the previous instructions in reverse. After reconnecting all the wires and putting everything back together the phone seemed to work perfectly…and then the screen stopped recognizing touch. Assuming it was just a loose wire, we removed the screen/digitzer/LCD assembly and reconnected the wires and everything seems to be back to new again. All in all, I’m impressed that the damage pictured above was fixable with about $15 and a little DIY confidence. I didn’t realize just how often people break the glass in these phones and I’m personally appalled that Apple charges between $199-$249 to do the exact same repair. It should also be noted that doing this repair yourself voids your warranty with Apple. Note that I’m talking about the 3G iphone and not the first-gen or 3GS. From what I’ve read, the replacement process is similar, but the glass/digitizer kit is more expensive for the 3GS and replacing the screen on the first-gen is supposedly a little harder because there’s more glue. Awesome, awesome, awesome, Jason. Thank you for this. My wife just dropped hers (http://www.flickr.com/photos/plasticmind/4135435331/) and I’ve just ordered the parts to do it myself. I’ll let you know how it goes! Glad I could help and Best of luck with the surgery. By the looks of your picture though, my wife is way better at breaking iPhones than yours. Amy’s 3G even had an incase slider case on it that I had just gotten her for Christmas. Oh well, all fixed now. And now the price of the replacement screen is $5.